For over 4 years, we have been using LS2 helmets and it was time for us to get new ones. LS2 is the most popular brand amongst starters and we had picked these as they looked good and were priced reasonably. 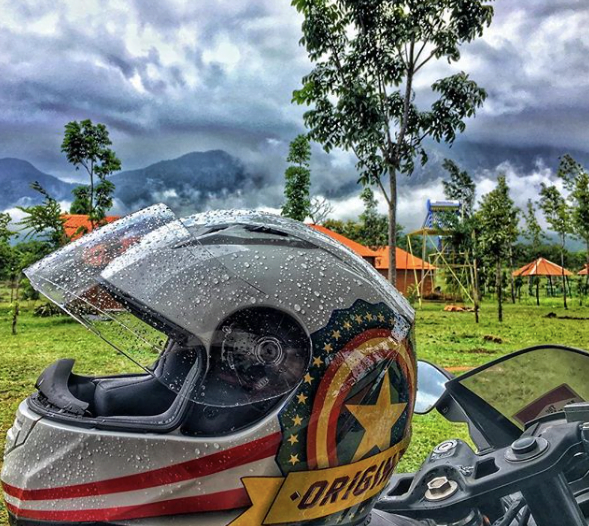 This time around we wanted to try a different brand and got to know about Motogear.in which is a distributor for Origine Helmets in India and based out of Chennai. Here is a detailed Origine helmet review for all bikers! We got the Origine GT Tek Silver and the Tonale Americano. The specifications as given by Motogear are listed below. Ishaq from Motogear.in had shipped these from Chennai and we were very impressed with the packing. The helmets came in a lovely orange Origine box and were wrapped in good quality helmet bags. Out of the box, it’s the first helmet I have opened that had such good looks, classy paint job and the look of superior quality. Suggested Read - Are you a biker? Then you must follow these! Let’s take a look about what you will like/dislike about these Origine helmets. We won’t talk about each helmet separately since both of them are very similar to each other. A look at the exterior of these helmets shows that they are compact, streamlined and well designed. The fit of the helmet is oval and should make for good aerodynamics. This design coupled with the optimal airflow provided by the ventilation system should allow for smooth, drag-free rides. One drawback is that when pressed from both sides the helmets tend to bend a little. We are not sure if they are designed to be flexible or if that’s a feature of the shell used. We tested the helmets at a top speed of 140kmph and there is some wind noise in both helmets but definitely not a deal breaker. At 1.4 kgs the helmets are quite light and should be suitable for all kinds of riders. Both helmets come with the standard transparent visors but the GT Tek comes with an additional sun visor. Pretty handy during summer rides and sits well with all kinds of head sizes. I would have been happier if they had come with pin lock for anti-fog capability. The drop-down sun visor on the GT Tek is easy to use and can be controlled using a slider at the side of the helmet. Both helmets come with vents on top with a slider for opening/closing. They are pretty easy to use and let a sufficient amount of air in to make for a comfortable ride, especially during hot weather. The padding inside is quite tight, snug and a little uncomfortable. But since they are new it’s quite natural and that’s how most helmets are. The padding needs to ensure that the head doesn’t move around much inside and here the Origines do the job. One of us wears glasses and we didn’t find it tough to wear them with the tight padding. It’s just a matter of getting used to it. What we liked was that the GT Tek had a small reflective piece at the bottom of the rear. Great feature for night riding! We are using the size L as it suits our physique. The helmet fits quite well and we found no movement at high speeds. The strap is quite comfortable and sits well without hampering movement. We did feel a little hot but that’s because the fit is very snug as of now. Origine has some great helmet designs and Motogear.in stocks quite a few of these. We really liked the overall feel of these helmets and love the paint job. Our only feedback would be that we would like to see better vents and a harder shell. So far we have tested these for around 1,000 km and have found no snags with them. We had some rainfall during our ride and didn’t notice any water seeping into the helmets. If you are looking to buy something different from the usual LS2, MT helmets then we would definitely recommend them. We are also very happy with the service Motogear has provided. Their delivery was right on schedule and we were very happy to see the packaging. Overall quite satisfied with Origine and Motogear. You can check them out on www.motogear.in along with other brands they stock. How Prince became India’s most photographed tiger! Thanks for the feedback Amit! !